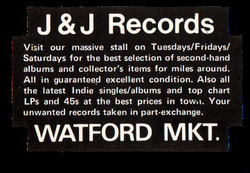 J&J Records had a bricks and mortar shop in Lower Kings Road, Berkhamsted, Herts as well as the market stall in Watford market. It was a tiny space but managed to cram in a great selection of new and used records. In the early 1980s most of my pocket money went in their till. Comment: T. L.